Though the terms, boss and leader are very often made use interchangeably, in actual fact, they are certainly not the same. All companies have a boss, who heads things, however not all companies have good leaders. For a company to function in a proper manner and to rise from strength to strength, good leaders are required in order to do the job in a satisfactory manner. Those companies which do not have good leaders eventually crumble to the ground and are forced to shut down in time. A good leader is someone who is not selfish by nature; rather he always has the interest of his own team at heart. Such a leader is someone who is a team player and never for once puts his own needs above or before the needs of the rest. The business world is filled with people who are rather selfish and only think of themselves. A boss is someone who is always looking to advance his own career and does not care about who he tramples on in the bargain. Good leaders think of everyone rather than putting their own needs first and that is what helps them move ahead in life. A good leader is someone who is never afraid of helping people advance. Such leaders never think of keeping people under their feet. On the contrary, they are most happy when people are able to do well for themselves and achieve something in life. As opposed to this kind of behavior, a boss is someone who is more than content to keep people under their rule. A leader makes people understand, why it is so important to get the task done, whereas a boss does not believe in giving such explanations, he believes that employees should just be driven like cattle and need not be given any kind of respect. A boss is someone who demands respect by virtue of his position. It is because he has the designation and title of a boss that people respect him even if they do not want to. In this day and age getting a job is not an easy task at all, that is why employees are forced into submission and are also forced into flattering the boss. A leader, on the contrary, is someone who may not necessarily have a high post in the office, yet people respect him or her not because they have to but because they want to. One of the chief things which distinguishes a boss from a leader is that a leader is ever sensitive and understanding to the needs of the employees whereas a boss is someone who is often insensitive and never bothers to go into the heart of things. A leader is someone who is marked by a great amount of humanitarian and humane feeling. No one can accuse a leader of being unfeeling and lacking in sympathy. Bosses often do not care about what problems others may be experiencing, they never bother themselves with listening to other people’s problems and issues. In most companies, the bosses are not selected according to capability or skill, they are selected simply by virtue of their birth. It is usually their fathers or grandfathers who have created the money and now since they have come of age, the company has become their responsibility. It is for this reason that bosses are incompetent and a dispensable part of the company. As opposed to this, the leaders form the very backbone of the company and without them, the company will seize to function in a proper manner. As it has been mentioned above, bosses are people who drive people to do work, whereas as opposed to that, leaders get jobs done by making people understand, how vital their role is in the company. People work, because they want to and not because they have to. A major difference between bosses and leaders is that a boss will get things done by compulsion and by instilling fear, whereas a leader will get things done, by making an employee excited about the task. Bosses ensure that people do not feel good about themselves else it might lead to overconfidence. It is rather unfortunate that boss usually uses negative reinforcement, whereas leaders make use of positive reinforcement. A mark of a good leader is that it is always easy to go and talk to him. He makes it a point to offer good advice and lend a helping hand when necessary. A boss is someone who has this great aura about him, so much so that people feel scared and intimidated to talk to such a person. A leader’s door is always open and people feel a sense of calm once they have poured their heart out to the leader. A leader does not give the impression that he is a superior being, a boss, on the other hand, acts like it is beneath him to speak to other regular employees. You will often notice that a boss is someone who always speaks in terms of I, me and myself, he always encourages his employees to work hard else his name and reputation would be at stake. As opposed to this kind of language, a leader is someone who gives a great many inspirational talks and always speaks in terms of the whole team. He says “we and us” and ensures that at all points in time, everyone feels like they are an invaluable part of the team. According to a leader, the employees in a company should always work in harmony with one another. A boss is someone who gets things done by hook or by crook. He just gives orders and expects things to be done. As opposed to this kind of ruthless and uncaring behavior, a leader is someone who has no qualms about getting his hands dirty and doing things for himself. If something needs to be done, he does not simply give directions, as opposed to that he does as much as he can on his own so that others do not feel too burdened or anxious. Having this kind of positive person on board helps the company in innumerable ways. Since bosses are usually so far removed from the rest of the company, it is easy to place anyone in the seat of the boss. Boss is someone who is just a ceremonial head who is not really involved in the actual working of the company. As opposed to that good leaders are exceptionally hard to find. Such individuals are needed to get the company out of problems on a day to day basis. Recruiters understand this and that is why they are constantly on the lookout for people with such leadership qualities who will give their all for the betterment of the company. It is rather unfortunate that most often, bosses form a hindrance rather than a help in the workplace. Their negative attitude is such that thwarts success rather than facilitates it. On the contrary, leaders are an inspiration simply because they get things done in an easy natural manner. As it has been mentioned above, such personalities manage to command our respect without even trying to do so. Everything about them is inspiring whether it is their words or even their deeds. Having such people in a company is indeed a great boon. Most bosses encourage other people to simply nod in agreement to whatever is being said. They hate it when people or employees offer alternate opinions or raise objections of any kind. As such bosses are people who are often unfair in the manner in which they act as well as function. And opposed to this, a leader is someone who encourages people to break out from their shell and speak up for whatever it is that they believe in. They love it when people put forth their new ideas as well as observations. In most companies, the bosses are very hot-headed people who shout at the top of their voices, the moment things get a little out of hand or the moment people make even the smallest of mistakes. On the contrary, a leader is someone who is naturally very good at solving problems and he never bothers himself by shouting or screaming. A leader keeps a cool as well as level head at all time so that none of the other employees get overwhelmed or worked up at any point in time. Being level headed is an art in itself which not many people are able to master. A boss is someone who always takes credit the moment something is done well in the company. It is not in his nature to call up the person who has actually done the hard work and congratulate him. A leader, on the other hand, is someone who is most delighted when others do well and he makes it a point to give credit when it is due. A leader never feeds of other people’s misery rather he rejoices in their success. A boss is someone who loves living in the limelight and hogging the spotlight, whether it is at events, or during occasions, he is the person who is seen the first and the most. A leader, on the other hand, is someone who works tirelessly in the background without expecting any praise in return. The joy of the leader is in knowing that the company is doing well. A leader is someone who makes an excellent boss because he is blessed with so much positivity and skill. 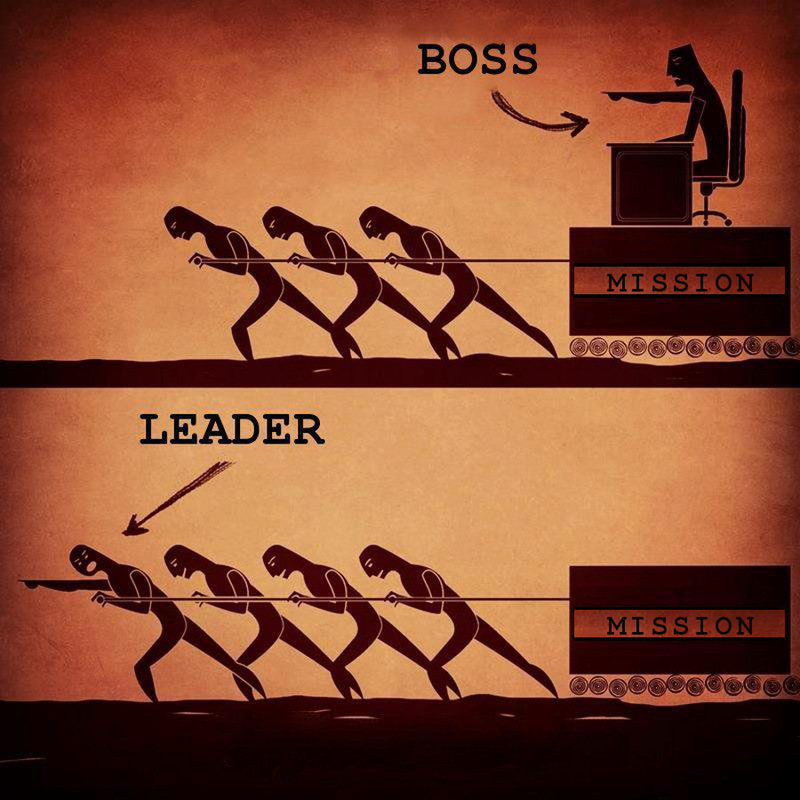 As opposed to that a boss is someone who may not necessarily make a good leader. Being a leader is something which is a gift in itself and if you are a leader you should make it a point to let this positive trait in you shine so that people can appreciate it and learn by your example. Though there are many other differences which exist between a boss as well as a leader, these are the chief ones which exist. For a company to be successful, the boss needs to be someone who is capable as well as strong. Running a company is certainly not an easy task at all. Not everyone has it in them, to run a company in a satisfactory manner. A good company is a company which is ever sensitive to the needs of its employees and never does anything which puts the well being of the employees in jeopardy. If employees do not have a good working environment, they will never be able to perform well.